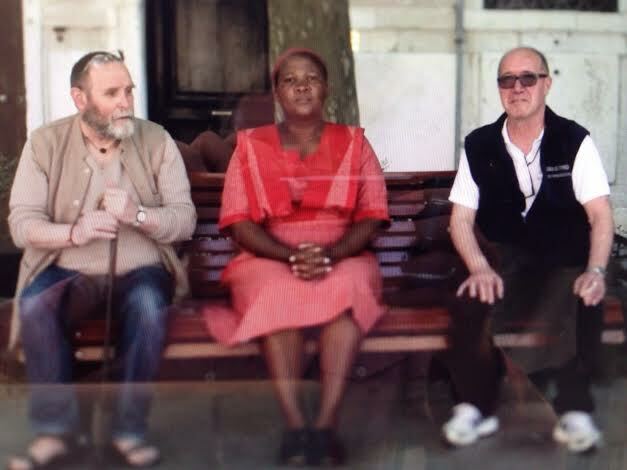 Text written for the catalogue accompanying performance and video events staged by the Johannesburg Pavilion at the 56th Venice Biennale 2015. 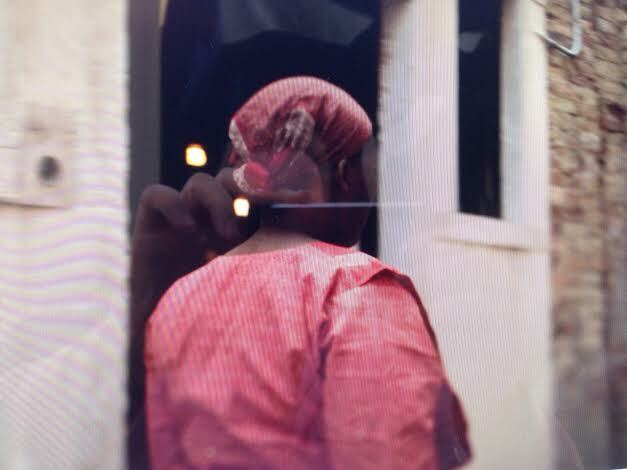 All images posted here are stills taken from video documentation of Senzeni Marasela’s performance work Intsomi zakwaXhosa. Courtesy the artist and the Jo’burg Pavilion. 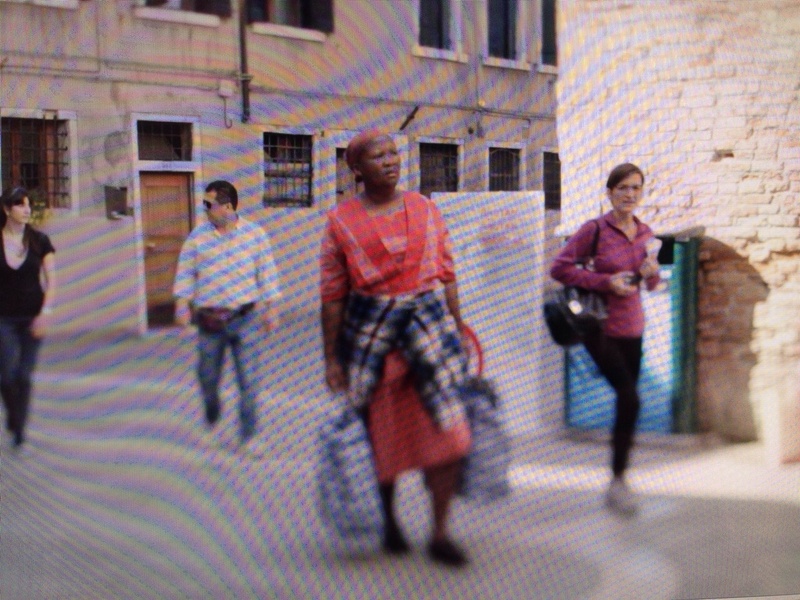 Senzeni Marasela and Theodorah Hlongwane travel from Johannesburg to Venice. They pack red dresses fabricated from Seshoeshoe cloth from Lesotho, one dress for each day. Theodorah, named after Marasela’s mother, is waiting and searching for her husband Gebane who left her behind in her village. The specificities of time and place are unknown although we know that this is a South African inflection of the universal story of women’s waiting. Theodorah travelled to Johannesburg in search of Gebane. She imagines that only he can release her from the dress of the married woman, which binds her to him. Senzeni, in character as Theodorah, will read fables and fairy-tales written in Xhosa, a language that she (Senzeni) can neither readily read nor understand. Marasela deliberately amplifies the sensations of displacement, and the affective oscillations of familiarity and strangeness. But how the familiar and the strange is experienced is contingent on what is seen and heard, how it is looking occurs and the form that listening takes. Marasela’s performances enter into dialogues with women’s memories and narratives: ‘I feel the need personally to participate in writing black women’s history. This includes exploring issues about our bodies, and how it is we survive trapped in-between two patriarchal worlds (one black, and the other white)’. As Senzeni performs Theodorah the borderlines between everyday life and staged performance are obscured and bleed across each other. 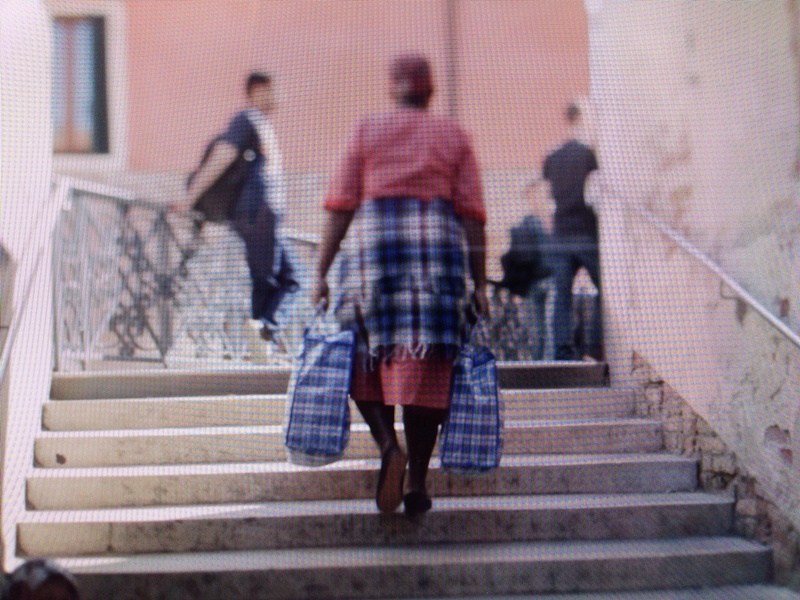 The figures Senzeni-Theodorah are transformed into sites of history, myth and memory while they are simultaneously physical-affective presences searching and moving across the public spaces of cities. “You Are Now Entering Soweto Johannesburg.” Screamed in chalk the borders I had created for my performance. 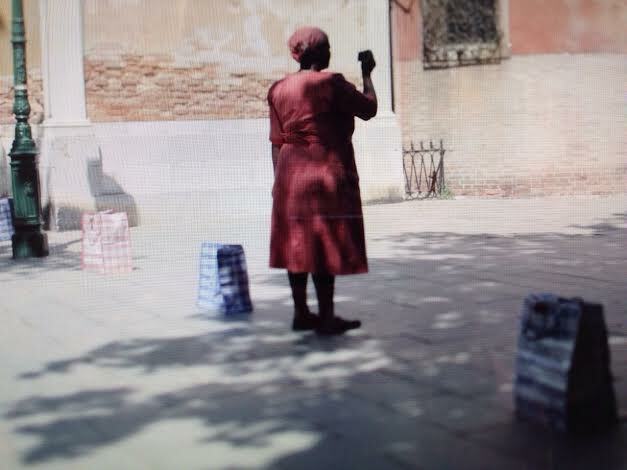 I wanted to “colonise” the church square space, first know it, make it familiar, and insert my alter ego Theodorah. 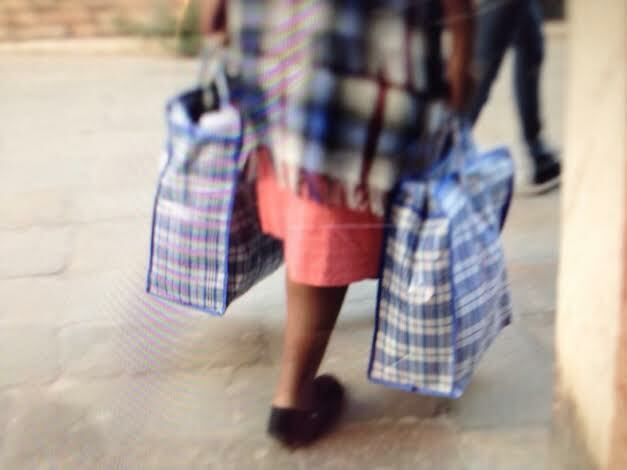 I used my Chinese bags fondly known as Oskhonza Ekaya, greet home, as further reinforcement of my space. I spend the better part of my performance negotiating these borders, measuring them with constant walking. Sitting in-between people at the park, whom at times completely ignored Theodorah and what I appeared to be doing. Slowly I disappeared as children with their parents played with my borders. 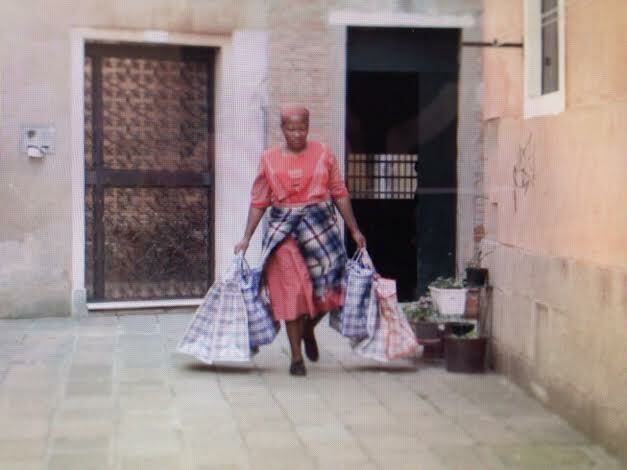 Soweto, Johannesburg where Theodorah is performed daily seemed obsolete, non existent, and Theodorah unable to speak in a place she no longer identified” – Senzeni Marasela, Venice, 2015. This entry was posted in Exhibition Catalogues and tagged Body, Performance, Senzeni Marasela, women and history, Women Artists. Bookmark the permalink.